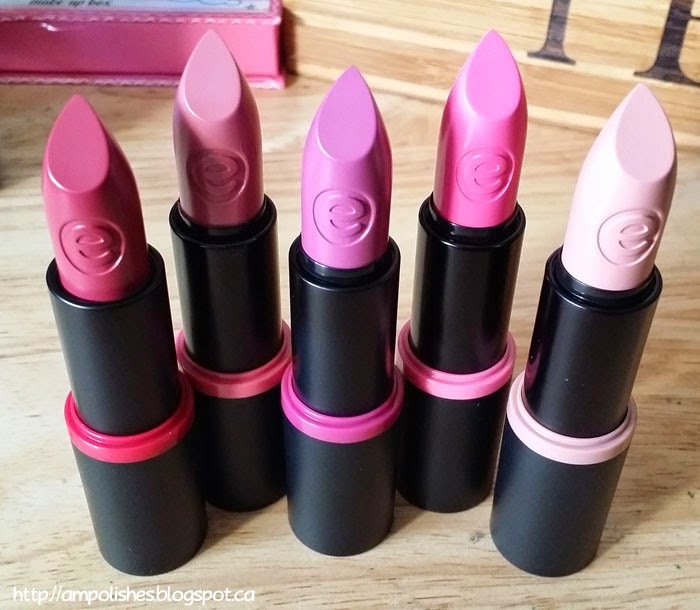 Today I have a few Essence lipsticks to review. Essence is available at Shoppers Drug Mart in Canada. They are vastly available in Europe and I am so happy Essence is available in Canada! 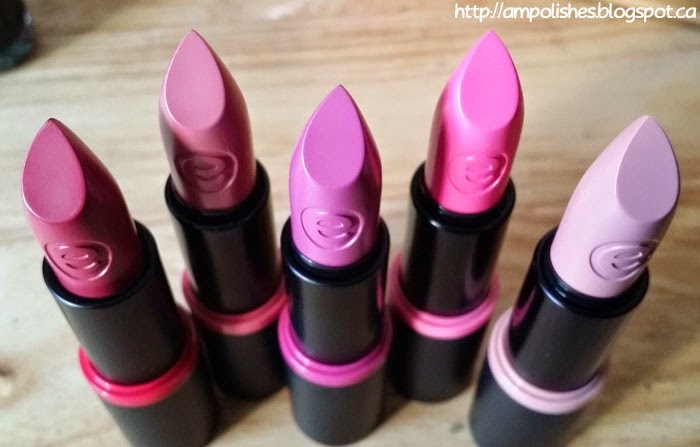 Most of their cosmetics range from $1 to $10. 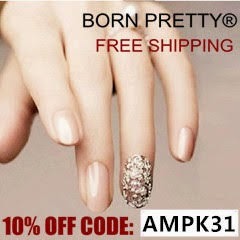 They are fairly inexpensive but the quality is quite good! 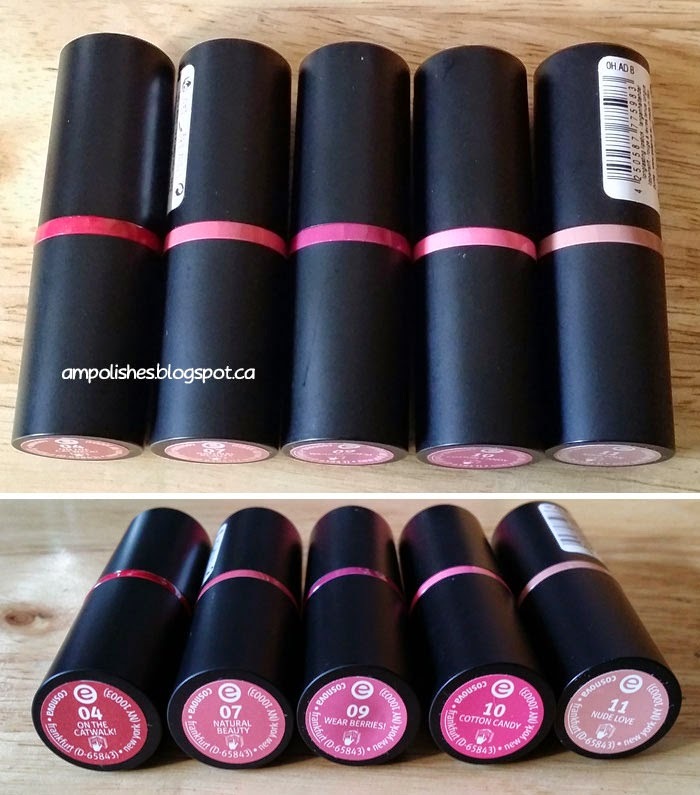 Lipsticks from this brand usually range from $1.99 to $2.99. So you can buy alot without feeling guilty about it ahaha. The packaging is quite plain. They're a normal plasticky black tube with a stripe of colour (supposed to be the same as the colour inside). There is also a label at the bottom showing the lipstick colour and name. 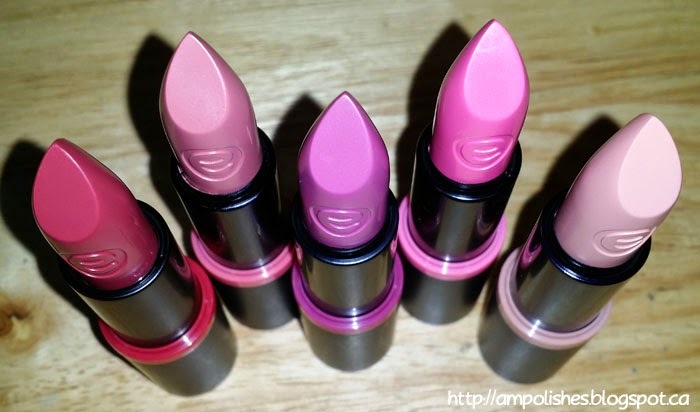 I think their older ones, the tube itself match the colour of the lipstick. I like these ones better. The formula is good.. creamy and opaque in about 2 coats, the colour is buildable. The colour lasts about 1-2 hours before having to reapply. It's not quite drying either so it's not uncomfortable. Overall, it's worth its money value and would totally recommend it! My favourite is Natural Beauty! It's the perfect everyday colour. It's not too different from my natural lip colour, just slightly brighter. It's beautiful! Swatches are hand are below, two coats each. They're opaque after 2 coats. They're creamy and smooth. 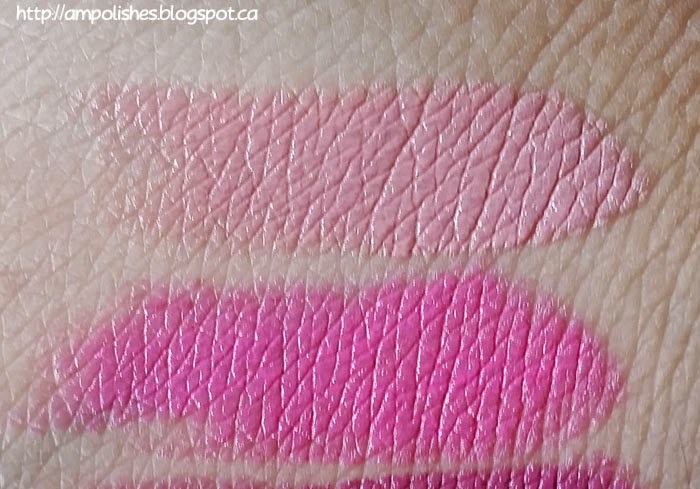 You can see how opaque they are on my swatches. Patting it down will give you just a slight tinge of colour but it becomes a bit drier when you apply it like that. 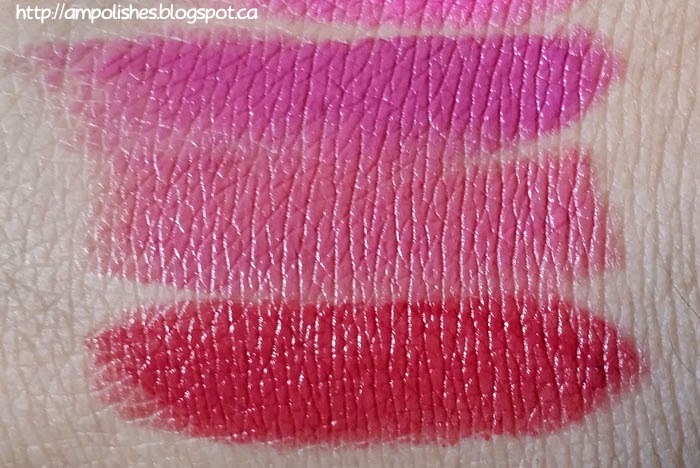 Close ups of the swatches. 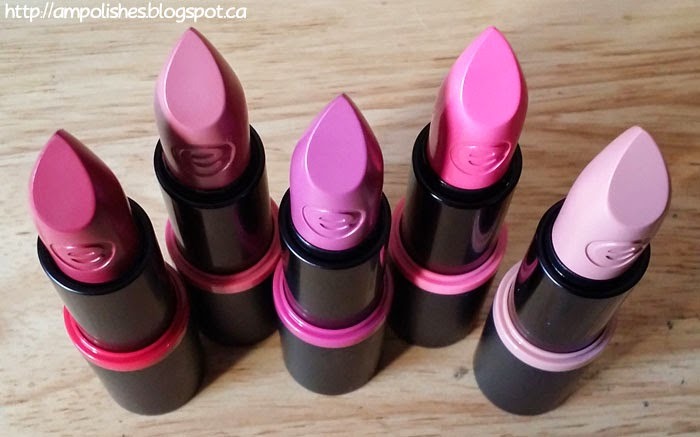 Essence is a drugstore brand which can be found at Shoppers Drug Mart in Canada. For other locations, please visit their website. Different countries may have a different web url. Most of Essence cosmetics are under $10. 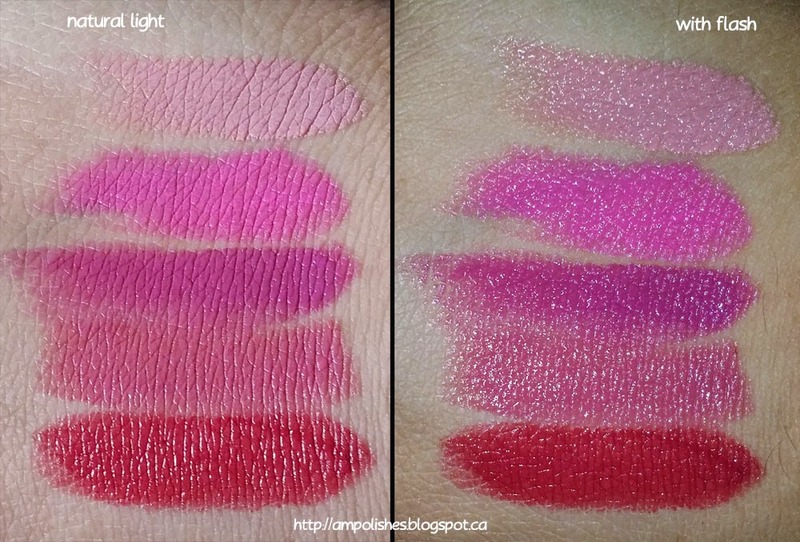 Lipsticks that I have featured in today's post are usually $2.99 CAD. Some stores may be priced differently. Thank you! Tell me if you will pick any up!! I already want a few more to try. Tell us below which ones is your favourite and if you bought any, which ones!